Momentum has slowed down a little bit, breadth has been somewhat weak, this is mostly due to the fact that the Russell 2000 has been down for three days in a row. Inauguration day and the beginning of earnings season are two catalysts some are pointing at as possible triggers for a pullback in the market. That remains to be seen and only time will tell. With earnings season right around the corner, it is important to check the earnings date of your holdings. 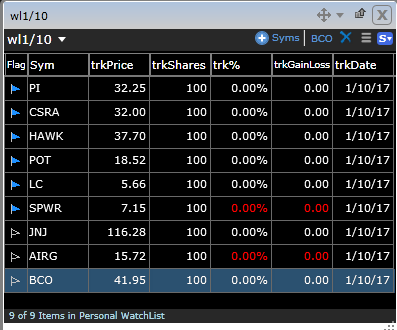 My long-only watchlist consists of a few names with an extra focus on $POT $LC $AIRG and $BCO. We have an interest in the above names if and only if they go through yesterday’s high. That one single criterion on most days eliminates a bulk of the names. These ideas are what we consider swing trades that can last anywhere from 1-10 days. Most stocks if not all go through a momentum burst that lasts 1-10 days and that is what we look to take advantage of.